Honda Cars Philippines, Inc. (HCPI), Honda’s automobile business unit in the Philippines, introduces the New Civic 1.8 E CVT Navi Limited Edition, now equipped with a navigation system and select Modulo accessories that provide better customer ownership for Honda’s sporty compact sedan. 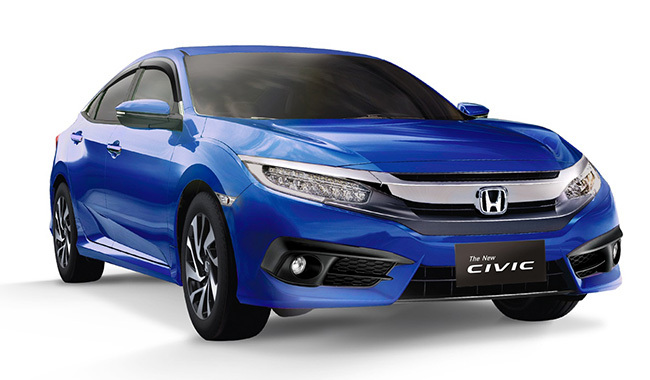 The highlight of the New Civic 1.8 E CVT Navi Limited Edition is the integration of Honda’s 7 inch touch screen Audio-Visual Navigation system which provides customers more ease and enjoyment as they navigate through their daily drive. Other features include Bluetooth connectivity for hands-free telephone functionality and audio streaming, HDMI Port and MiraCast projection for screen mirroring, and USB input for media playback. The New Civic 1.8 E CVT Navi Limited Edition is equipped with select Modulo accessories. For the exterior, accessories such as a Modulo deck lid spoiler and Modulo door visors are added for sporty aesthetics. A Modulo trunk tray is also added for improved cargo functionality. All of which will come standard in the New Civic 1.8 E CVT Navi Limited Edition. The New Civic 1.8 E CVT Navi Limited Edition is powered by a 1.8 liter engine that produces a maximum power output of 141 PS at 6,500 rpm and maximum torque of 17.4 kg-m at 4,300 rpm and is mated to an Earth Dreams Technology developed Continuously Variable Transmission (CVT). This allows for a powerful yet uncompromised fuel efficient performance. With the exclusive features and colors available only for the New Civic 1.8 E CVT Navi Limited Edition, customers are encouraged to reserve now and be one of the very few to take ownership of this very limited offer.